Wing expanse 11.5-20 mm. Forewings a uniform brownish gray, in fresh specimens often with scattered grayish white scales that impart an iridescent bronzy lustre from certain angles. Specimens from the Central Basin of Washington tend to be much lighter, whereas specimens from the Sierra Nevada of California are darker than those from other areas. Hindwings of the same color as the forewings of the common form, but without glistening properties. This species should be unmistakable. It shows slight resemblance to Lampronia humilis, but that species is far smaller. 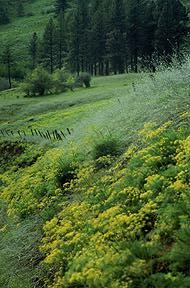 In the Central Basin of Washington, it can be confused in the field with the coexisting, smaller G. subalba. The more elongated wings and a much elongated seventh abdominal segment in politella females should suffice for definitive identification. 7th abdominal segment and ovipositor of G. politella. The species feeds exclusively on members of the Saxifragaceae. 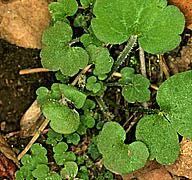 Several species of Lithophragma, Heuchera grossulariifolia (Davis et al. 1992), H. micrantha, and H. saxicola (Pellmyr, unpubl. obs.) are known hosts. Females oviposit into the floral ovary of the host, and one or more larvae per capsule complete the first one or two instars feeding on seeds. After aestivation, later instars create a shelter of leaves on their host, complete feeding, and pupate inside of it. Female ovipositing into host Lithophragma flower, and folded leaf containing late-instar larva or pupa of G. politella. This is the most widely distributed Greya species. It occurs in drier areas ranging from southern British Columbia to the California Channel Islands and the southern Sierra Nevada, and from the Pacific coast to eastern Idaho and southwestern Colorado, USA. 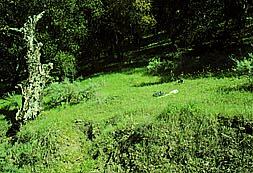 In the southern part of the range in open oak woodland, often with Ceanothus and Artemisia. 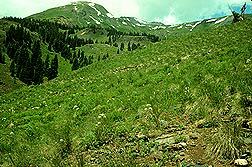 In the more northern areas found in open grassland and at the edges of dry, open ponderosa pine forest. Populations in the central basin of Washington appear in sagebrush steppe. Elevational range, sea level to 3000 m. The species has been found in coexistence with all Greya species except punctiferella, pectinifera, variabilis, and variata in different parts of its range. Characteristic habitats in Nez Perce Co., Idaho, San Juan Co., Colorado, and Tulare Co., California, USA. Greya politella is the most extensively studied species in the genus, being subject to studies of many aspects of pollination behavior, pollinator community effects, and complex interactions with hosts (Pellmyr & Thompson 1992, Thompson and Pellmyr 1992, Pellmyr & Thompson 1996, Pellmyr et al. 1996, Thompson 1997) and phylogeographic history in relation to host utilization (Brown et al. 1996). It is an efficient passive pollinator of at least two Lithophragma hosts during oviposition, transporting ample pollen of its host on the abdomen between flowers. Larvae consume relatively few seeds, and the species can be a mutualist relative to the host. The relative density of copollinators will determine whether the beneficial effects will manifest in plant seed set, and thus whether selection for reciprocal specialization occur in populations. Further ecological studies of G. politella and the species that it interacts with are currently under way by and associates at Washington State University. Lectotype in the Natural History Museum, London. Brown, J.M., J.H. Leebens-Mack, J.N. Thompson, O. Pellmyr & R.G. Harrison. 1996. Phylogeography and host association in a pollinating seed parasite, Greya politella (Lepidoptera: Prodoxidae). Mol. Ecol. 6, in press. Davis, D.R., O. Pellmyr & J.N. Thompson. 1992. Biology and systematics of Greya Busck and Tetragma n. gen. (Lepidoptera: Prodoxidae). Smiths. Contrib. Zool. 524:1-88. Pellmyr, O. and J. N. Thompson. 1992. Multiple occurrences of mutualism in the yucca moth lineage. Proc. Natl. Acad. Sci. USA 89:2927-2929. Pellmyr, O. and J. N. Thompson. 1996. Sources of variation in pollinator contribution within a guild: the effects of plant and pollinator factors. Oecologia 107:595-604. Pellmyr, O., J.N. Thompson, J. Brown & R.G. Harrison. 1996. Evolution of pollination and mutualism in the yucca moth lineage. Amer. Nat. 148:827-847. Thompson, J.N. 1997. 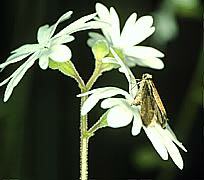 Coevolution among geographically structured populations: Greya moths and their host plants. Ecology, in press. Thompson, J.N. & O. Pellmyr. 1992. Mutualism with pollinating seed parasites amid co-pollinators: constraints on specialization. Ecology 73:1780-1791. Page: Tree of Life Greya politella (Walsingham). Authored by Olle Pellmyr. The TEXT of this page is licensed under the Creative Commons Attribution-NonCommercial License - Version 3.0. Note that images and other media featured on this page are each governed by their own license, and they may or may not be available for reuse. Click on an image or a media link to access the media data window, which provides the relevant licensing information. For the general terms and conditions of ToL material reuse and redistribution, please see the Tree of Life Copyright Policies.